Are you, like me, appalled by the sheer volume of prawn heads thrown away every time you bring home some prawns? Well, save them next time – because today, we are going to make chili paste with them. Yes THAT chili paste. The one you like to eat with cream crackers, rice and curry, bread, naan, roti and basically with anything on this planet. 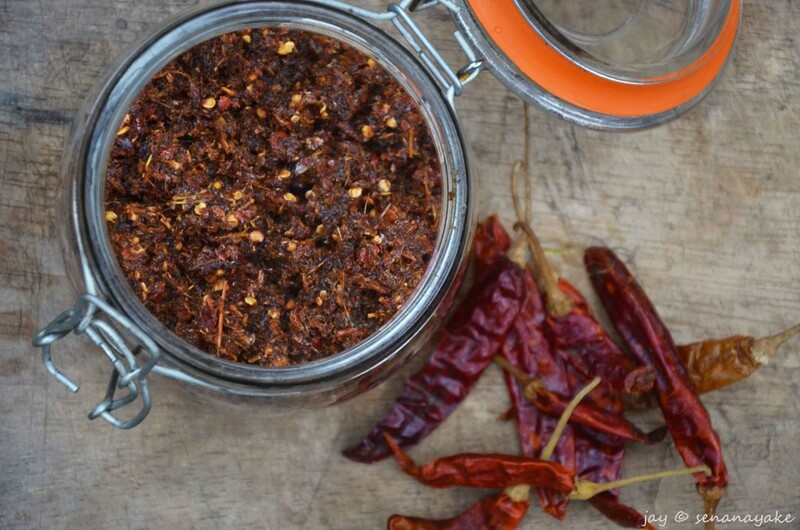 You have a jar of it at home and in most households I know, a bottle of chili paste is as indispensable as the jar of salt and the bottle of lunu dehi in the pantry. Nobody really knows when or how it came to be such an integral part of the Sri Lankan household registered itself in the Sri Lankan household. Sometimes referred to as the Chinese chili paste, the origin of the chili paste is as a small, oily and dark red lump on the side of the “Chinese” fried rice that you got from the myriad “Chinese restaurants” of Ceylon. 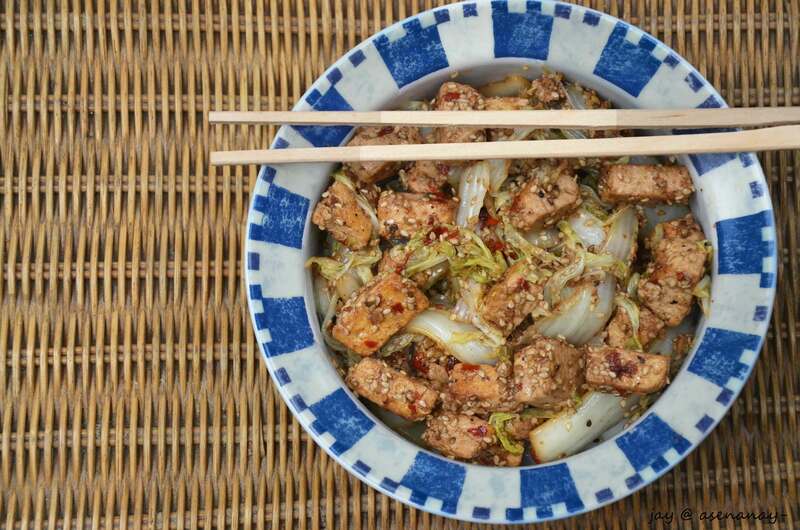 But I doubt that there’s anything Chinese about it – much less than the Sri Lankan “Chinese food” that we find here. 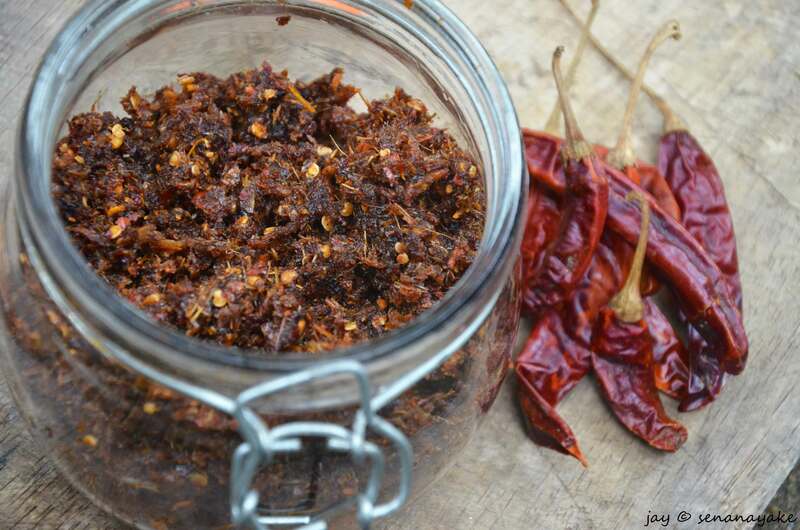 However, I do detect Indonesian roots somewhere there – the resemblance it bears to Sambal Oelek – the Indonesian chili paste is rather uncanny. Different people make this in different ways – with ingredients ranging from shrimps, tomatoes, ginger, garlic, onions and etc. This is how we make this at home and it is so very delicious. Being mild of palate, we go easy on the chili so please feel free to play around with the chili as per your liking. Deep fry the prawn heads until crispy. Before deep frying, make sure that the prawn heads are well-drained of water as when they hit the hot oil they tend to burst. Keep the oil pan covered to avoid any hot oil injuries. Grind the lemongrass in a grinder until smooth. Keep aside. Grind the deep fried prawn heads. Keep aside. In a wok, heat about 5 tblsps of oil. When the oil is heated enough, add the lemongrass. Once it is fried well, add the ground prawn heads. At this point the mixture may aborb all the oil and if the mixture looks too dry, add a little more oil. Add to this salt, pepper, palm sugar and the soup cube. Combine well. Add the chili flakes. Fry till the mixture is fragrant. Et voila! Chili paste is served. The indispensable condiment that adorns almost every dining table of this lovely island haven – that relish that makes you cry one minute and sing hallelujah to heavens above the very next moment. 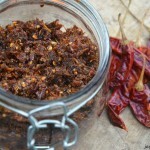 We as a family have rather mild palates and therefore we avoid too much heat – rather uncharacteristic of typical Sri Lankans whose mealtimes are not complete without their fair share of brain numbing, steam-inducing chili influence. Therefore, the prominent taste of this particular dish is of prawns – that delicious sea-like taste which lets escape a blissful sigh even without you knowing it. It is quite pungent – in a good way and you can smell it first of all before tasting it really. And from within those fathomlessly dark flavours of deep-fried things and simply, sea comes the piquant chili – the uniquely lacerating quality of it with the underlying sweetness of palm sugar, the umami of the soy and the full-bodied saltiness of the oyster sauce. The play on the flavours is remarkable and you have your taste buds in knots trying to express it coherently. I would say it is best if you just make it and experience it yourself. Fried prawn heads. Crunchy and quite delicious even as a snack! When frying the prawn heads, carefully lower the heads into hot oil and cover the wok with a lid. This will keep it from oil spitting and minimize the burning hazards. 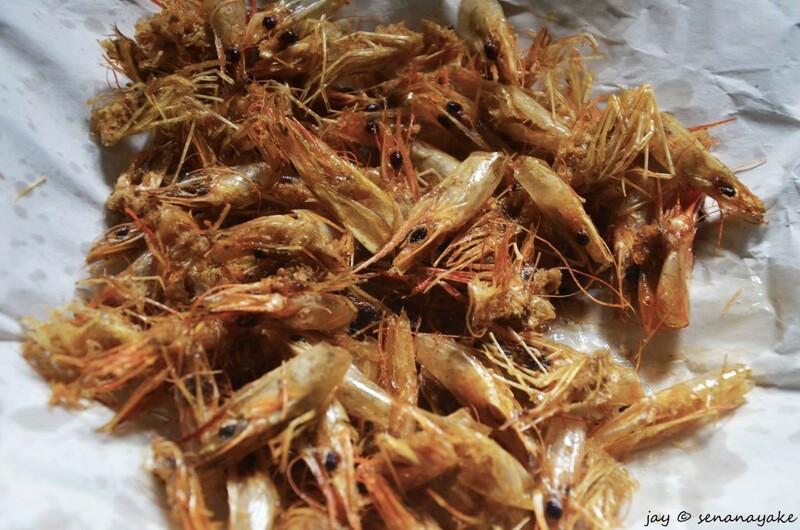 Also, drying the prawn heads thoroughly before frying helps minimize the oil spitting. This is a very oily condiment. If you want to keep it healthy, you can use olive oil or pure coconut oil in the preparation right from the frying. Adjust the chili and seasoning as you wish. The measurements given are for a mild relish. Don’t have prawn heads? You can still make this with shrimp, or dried small shrimp (the ones we call koonisso) if you like. Just follow the same procedure and you should be fine. I just returned from Sri Lanka and brought home some spices I bought at a local spice shop. The guys at the shop claimed their spices would last for years compared to the prepackaged spices which would only last weeks (because of the salt? so they said..). I have a few questions – not sure if you’ll be able to answer…. I bought Garam masala mix (with whole seeds, cinnamon sticks, curry leaves, etc..). Does this need to be ground up before using? I also bought chili. That was as far as the shopkeepers description went. It look very much like the pictures in this post of yours. It’s sort of wet/oily and clumpy and dark red. I put it in a mason jar and it is building up a lot of air. Every time I open the jar it releases air as if cracking a soda. Why is it fermenting? Should I be keeping it in the freezer? Not sure if you’ll be able to help me but looking for some advice! Well, the advantage of prepackaged spices is the fact that they have an actual expiry date on which you can rely . Spices that you buy loose have no such guarantee. If anything, salt should prolong shelf life, not shorten it. And as per my knowledge, not even the prepackaged spices have any salt in it. I think this shop person has tried to deceive you. Next time you are in Sri Lanka and you want to purchase spices, just walk into a well known supermarket – any Keells of Cargills would do and make your purchases. And yes, the garam masala mix must be ground up. Otherwise it would not yield much flavour. Did you but Chili or chili paste? Chili comes in several forms in Sri Lanka. The green chili – which is fresh chili, the dried chili, the red, dried ones that you see in the picture beside the jar, chili powder which is a fine, dry fiery red powder and then there is the chili flakes – flakes of fiery red speckled with yellowish seeds. Out of all this, only chili paste comes in a jar. And from what you describe, I think you may have gotten chili paste – which is a product made from chili and shrimp paste. As to my knowledge, there is no reason why chili paste should be building air unless it has gone bad. Does it taste stale and smell slightly off? If it does, it’s not safe for consumption. I think next time you come to Sri Lanka, you should just find this shop keeper and give him a good scolding so that he would never try to fool anyone again. And if you are buying spices and other such ingredients, it’s better to purchase at a supermarket where the prices are fixed and nobody is trying to rip you off.